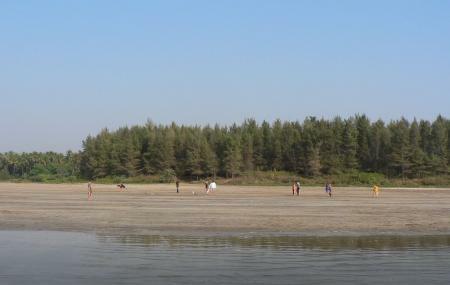 Awas beach is the most peaceful beach around Alibag. It is close to a popular beach called the Kihim beach, where most of the crowd likes to spend their time playing and bathing. This beach is for those who seek tranquillity and for those who need an excuse to slip into contemplation. The scenery is mind blowing. The sea is unending and on the other side, the shoreline is bedecked with the beautiful Casuana and Suru trees. There are not many eateries and businesses along this beach, which helps for maintaining the peace. Carry your own snacks and waterbottles. Ask the locals for directions. Hire a cab from Alibag town. How popular is Awas Beach? People normally club together Kihim Beach and Versoli Beach while planning their visit to Awas Beach. It's a good beach..But if you visit at Ebb time then you will get disappoint because its very rocky beach and you will not able to play in water much. Otherwise its a scenic place ..Not much crowdy.. Calm and beautiful.Parking available outside. The beach is just few kilometers away from the port and you can have one of the best sunset views at this place and no need to worry about being alone, there are enough tourists visiting this beach. The surrounding is pretty peaceful and the beach in quite calm and away from crowd. Not much activities arranged like Alibaug hence only families or groups of people who wishes to have a peaceful time can visit. Had a peaceful stay! Good beach. There is lot of rocks near the beach area and water front. Not recommended to play in water. Lot of space to play on the beach.